One for the Cineastes – Snippets of history from the world’s greatest capital city! As longstanding Estate Agents in W1, we know a great building when we see one! 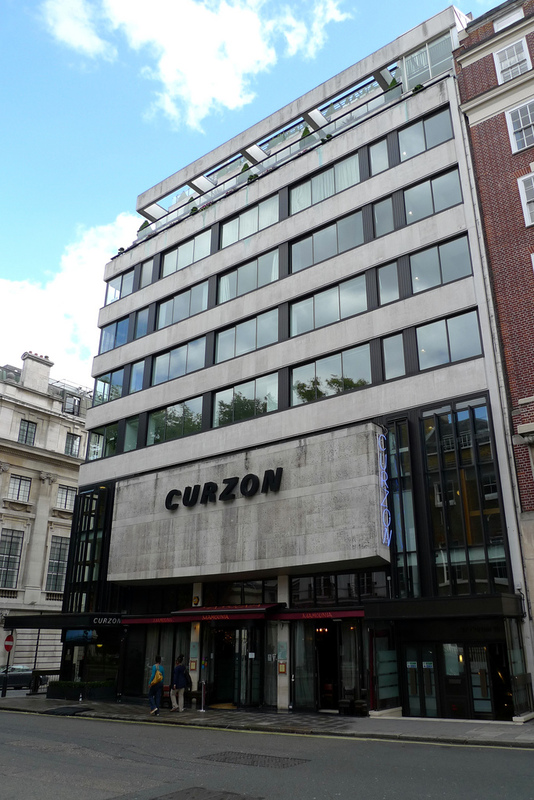 And the Curzon Cinema in Mayfair is undoubtedly (well, in my opinion anyway) the best post war cinema in London. It is housed within a beautiful (OK – you can debate that one with me) Grade II listed building and was built in 1963 by HG Hammond of Burnet Tait & Partners, replacing the Modern Dutch cinema built in 1934 by the same firm. From the outside – on Curzon Street, it appears as a windowless stone panel and around the corner by the entrance in Hertford Street as windowless brick sections. The interior features illuminated coffered ceilings designed by Victor Vasarely, these contrast with the rough fibreglass murals by W Mitchell & Associates. It boasts a 530 seat auditorium, a vast 43 foot by 20 foot screen and two royal boxes, and in 2002 the rear stalls were converted into a second screen so they could offer a wider selection of film. and it was one of the first cinemas to show foreign language films in the UK. One of the most prominent art-house cinemas in London (being one of the first cinemas to show foreign language films in the UK), with plush seating and a refurbished bar, this cinema is a treat for any cinephile. As autumn is now upon us and the nights are drawing in, why not go and experience the cosy Curzon Mayfair for yourself while catching up on the latest blockbusters? I’d say that was quite the plan!